« Welcome to the Re-Launch of M Design Boutique! Celebrity Birthday Gift From M Design Boutique! Several weeks ago, I was contacted by a colleague of Chelsea Handler about creating an original, custom gift for her birthday. For those of you not familiar with her, Chelsea is known for her hilarious books, stand-up comedy, television shows and in general…her irreverent sense of humor that comes with a refreshingly honest view into her own life, opinions, family, past…and just about everything else. As a fan of Chelsea Handler, I was super excited about the challenge of delivering something custom, high-end and of course, funny. 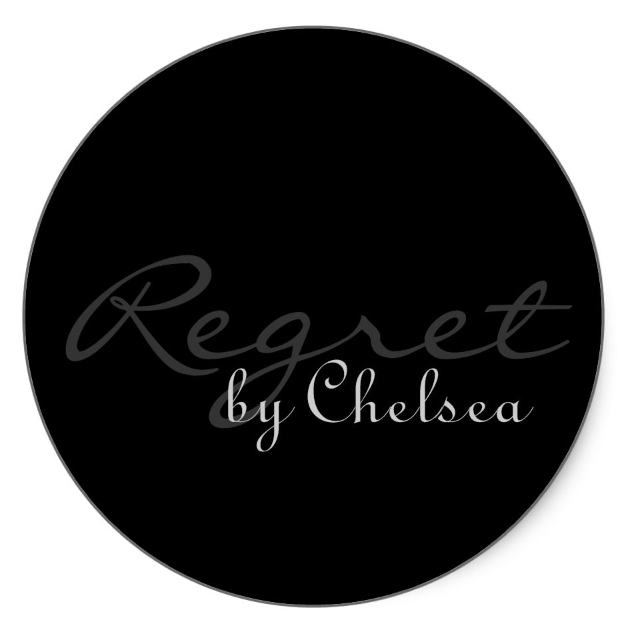 Chelsea has made reference to a fragrance line called “Regret”, which was the direction I was given with my budget. The concept just demanded to be fleshed out with some specific products from M Design Boutique. I decided the overall fragrance would be a blend of Grass, Ylang Ylang (because everyone loves ylang ylang…even if they don’t know it) and a hint of Cedar and Vanilla. I also added a dash of SECRET just to make this a signature scent that cannot be duplicated by anyone but the likes of M Design Boutique! 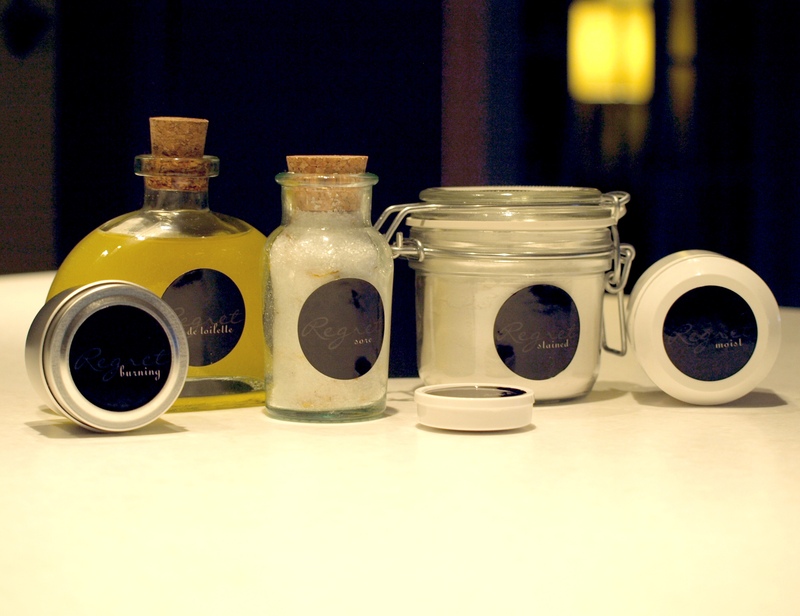 The “fragrance line” included several bath and body products available in my shop (or will be soon in other fragrances). 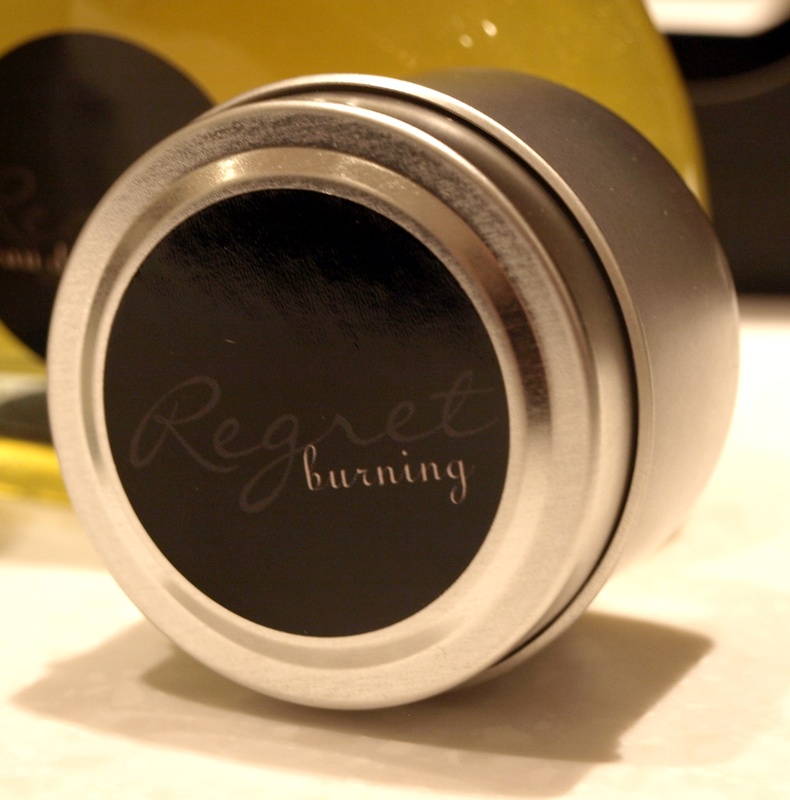 Each product had its own title…just to add in another layer of “Regret”. Here are the product descriptions! Full product photo follows. Eau de Tiolette – This is a gentle perfume or body splash, of course with a Belvedere Vodka (Chelsea Handler’s favorite beverage) and Witch Hazel base, packaged in a blown-glass cologne bottle, corked and wax sealed for freshness. 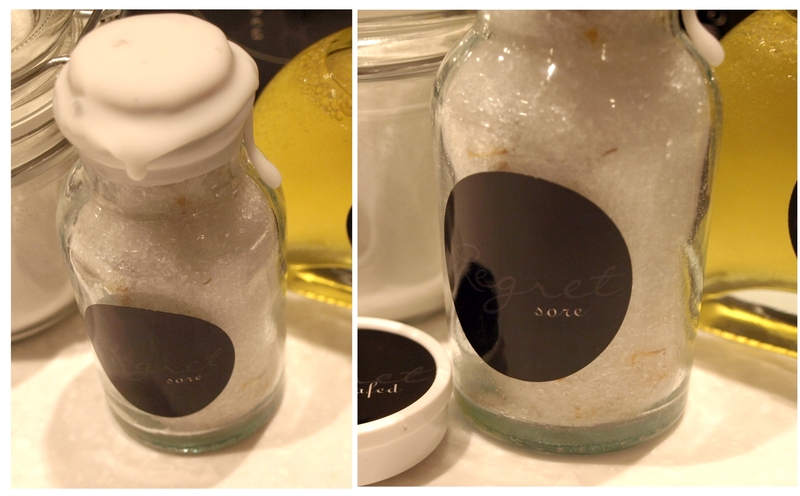 Sore – Epsom, Sea and Dead Sea Salt blend with real Calendula petals, glycerine and of course “Regret” fragrance oil. To be used as bath salts, or even a calming foot soak when added to hot or warm water and dissolved. 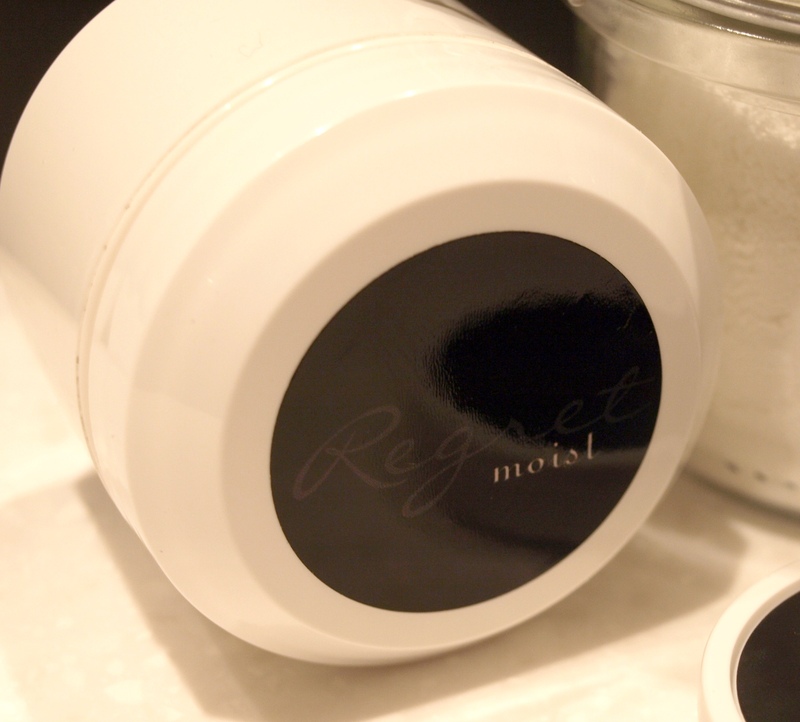 Moist – This yogurt-based body butter is an all-natural rich creamy lotion infused with shea butter and perfect for super dry skin. 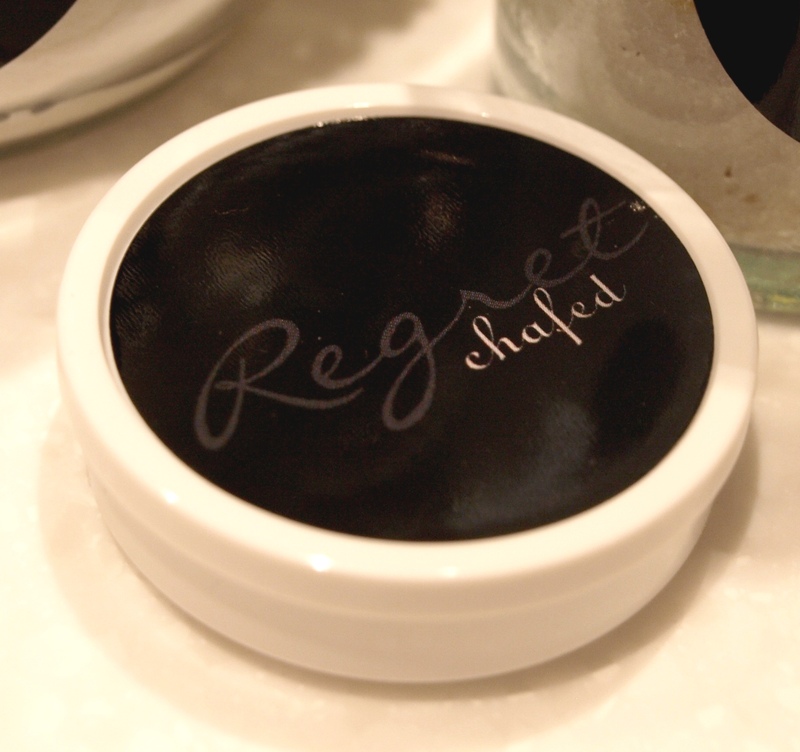 Chafed – A balm for lips or other dry, cracked skin such as knees or elbows. Burning – Beautiful soy wax travel candle to burn during romantic moments, or perhaps to reflect on those moments you “Regret”. 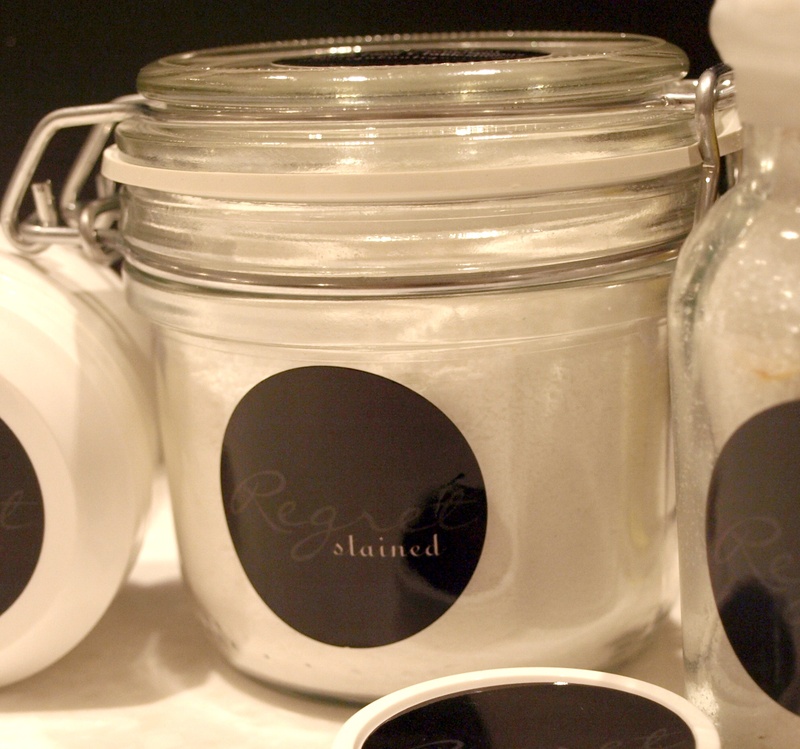 Stained – All-natural laundry powder works on its own, or can be added to regular wash loads to boost stain-fighting capabilites. Here is the line pictured together. WOW! Super impressive! You are fabulous! Very nice! Love the labels! 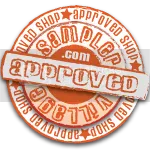 You have great products! I had no idea, Melissa! Amazing!